lt;stronggt;PAC101202lt;/stronggt;lt;BR/gt;Pacon Decorol Flame Retardant Art Rollslt;BR/gt;Brightly colored paper in a convenient roll for all large projects. Made of 100% vat-dyed sulphite for superior strength and fade-resistance. Durable surface takes on all types of media on either side. Great for art projects, banners, murals and bulletin boards. 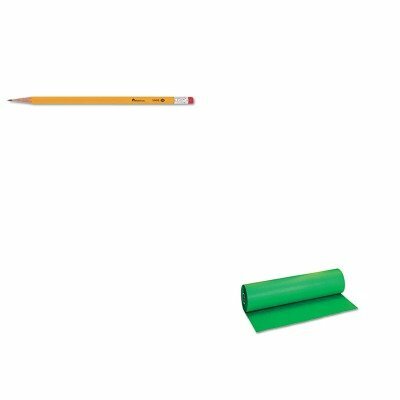 Size: 36amp;quot; x 1,000 ft Paper Colors: Tropical Green Paper Weight: 40 lb.lt;BR/gt;lt;BR/gt;lt;stronggt;UNV55400lt;/stronggt;lt;BR/gt;Pacon Decorol Flame Retardant Art Rollslt;BR/gt;Economic pencil delivers first-rate quality at an affordable price for all your writing needs. Soft lead provides a smooth writing experience every time. Hexagonal barrel fits nicely into your hand and won't roll off tables or desks. Pencil Type: Woodcase Lead Colors: Black.